"The clans simply have no respect for the authorities." A court in Hanover has handed suspended sentences to six members of a Kurdish clan who seriously wounded two dozen police officers during a violent rampage in Hameln. The court's ruling was greeted with anger and derision by police who said it is yet another example of the laxity of Germany's politically correct judicial system. The case goes back to January 2014, when a 26-year-old clan member, arrested for robbery, tried to escape from the magistrate's office by jumping out of a seventh-floor courtroom window. The suspect was taken to the hospital, where he died. Members of his clan subsequently ransacked the hospital, as well as the court, and attacked police with rocks and other projectiles; 24 police officers and six paramedics were injured. The judge said he was lenient because the defendants witnessed the death of the 26-year-old and were traumatized. The judge also revealed that he had reached a deal with the clan, which among other effects prevented police from testifying in court. "If we want to protect those who ensure public security, it must be clear that anyone who attacks police officers attacks the state — and has to fear appropriate consequences. It does not matter from which milieu the perpetrators come." Observers have surmised that the real reason for the judge's leniency was that he feared his family might be subjected to retribution from the clan. Middle Eastern crime syndicates have established themselves across Germany, where they engage in racketeering, extortion, money laundering, pimping and trafficking in humans, weapons and drugs. The syndicates, which are run by large clans with origins in Lebanon, Turkey, Syria, among other places, operate with virtual impunity because German judges and prosecutors are unable or unwilling to stop them. The clans — some of which migrated to Germany during Lebanon's 1975-1990 civil war and have grown to thousands of members — now control large swathes of German cities and towns — areas that are effectively lawless and which German police increasingly fear to approach. "In their concept of masculinity, only power and force matter; if someone is humane and civil, this is considered a weakness. In clan structures, in tribal culture everywhere in the world, ethics are confined to the clan itself. Everything outside the clan is enemy territory." "The clans adhere to a religious group, a kind of sect with an Islamic orientation. The Islamic understanding of their spiritual leader, Sheikh al-Habashi, who died a few years ago, justifies violence against unbelievers. He taught that there is only the house of ​​war [Dar al-Harb], which justifies plundering unbelievers and possessing their wives...."
In Berlin, a dozen or more Lebanese clans dominate organized crime in the German capital, according to Die Welt. They effectively control the districts of Charlottenburg, Kreuzberg, Moabit, Neukölln and Wedding. The clans are committed to counterfeiting, dealing in drugs, robbing banks and burglarizing department stores. Experts estimate that around 9,000 people in Berlin are members of clans. The clans reject the authority of the German state. Instead, they run a "parallel justice system" in which disputes are resolved among themselves with mediators from other crime families. A classified police report leaked to Bild described how the clans use cash payments and threats of violence to influence witnesses whenever German police or prosecutors get involved. "The refugees come here with no money. They are shown how inexpensive money can be obtained very quickly. Poverty makes this seductive. Many of them cannot speak German and are naturally vulnerable when they are addressed by someone in their native language. For the clans, the refugees are welcome newcomers, because they are new here and are not known to the police." The clans have also entered the refugee business by buying real estate and renting those properties to asylum seekers at exorbitant prices. Focus magazine reported that they are laundering dirty money while at the same time getting paid by the German state to house migrants. Focus reporters visited a dilapidated apartment in Berlin in which five Syrian refugees were accommodated in 20 square meters (215 square feet). On the regular rental market the apartment would barely have yielded €300 ($335) a month in rent, but the clan collects around €3,700 ($4,125) per month from the German state, which pays landlords to house migrants. "Business with the refugees is now more profitable than drug trafficking," said Heinz Buschkowsky, a former mayor of Neukölln. The Berlin Criminal Police Office (Landeskriminalamt) confirmed that "proceeds from criminal offenses, including organized crime, were invested in real estate by the persons concerned or by third parties." Tom Schreiber, a member of the Berlin House of Deputies, said the clans have exposed the moral bankruptcy of the German government: "The state promotes organized crime with taxpayer money." "Berlin is lost," said Michael Kuhr, a well-known Berlin-based security consultant. "These clan structures have established themselves in all areas of organized crime. We will never go back to how things were 20 years ago. In addition, these people are highly dangerous and have lost all respect for the power of the state." In Duisburg, a leaked police report revealed that in the Marxloh district, the streets are effectively controlled by Lebanese clans that reject the authority of German police. They have taken over entire streets to carry out illegal business activity. New migrants from Bulgaria and Romania are contributing to the problems. Marxloh's streets serve as invisible boundaries between ethnic groups, according to Die Welt. Residents speak of "the Kurdish road" or "the Romanian road." A 17-page report prepared for the state parliament in North Rhine-Westphalia (NRW) revealed that Lebanese clans in Duisburg divide up neighborhoods in order to pursue criminal activities. These clans do not recognize the authority of the police. Their members are males between the ages of 15 and 25 and "nearly 100%" of them are known to police. Peter Biesenbach of the Christian Democrats (CDU) said: "If this is not a no-go area, then I do not know what is." He has called for an official inquiry to determine the true scope of the criminal clans in NRW. Senior members of the Gelsenkirchen police department subsequently held a secret meeting with representatives of three Arab clans in order to "cultivate social peace between Germans and Lebanese." A leaked police report revealed that the clans told Police Chief Ralf Feldmann that "the police cannot win a war with the Lebanese because we outnumber them." The clan members added: "This applies to all of Gelsenkirchen, if we so choose." When Feldman countered that he would dispatch police reinforcements to disrupt their activities, the clan members laughed in his face and said: "The government does not have enough money to deploy the numbers of police necessary to confront the Lebanese." The police report concluded that German authorities should not harbor any illusions about the actual balance of power: "The police would be defeated." Another leaked police report revealed that the clans are the "executive body of an existing parallel legal system to self-adjudicate matters between large Kurdish and Lebanese families in the western Ruhr area." These clans "despise the police and German courts" and "settle their matters on their own terms." The Frankfurter Neue Presse reported that Kurdish, Lebanese and Romanian clans have divided up the Gelsenkirchen districts of Bismarck, Rotthausen and Ückendorf, including around the central station, and have "claimed individual streets for themselves." 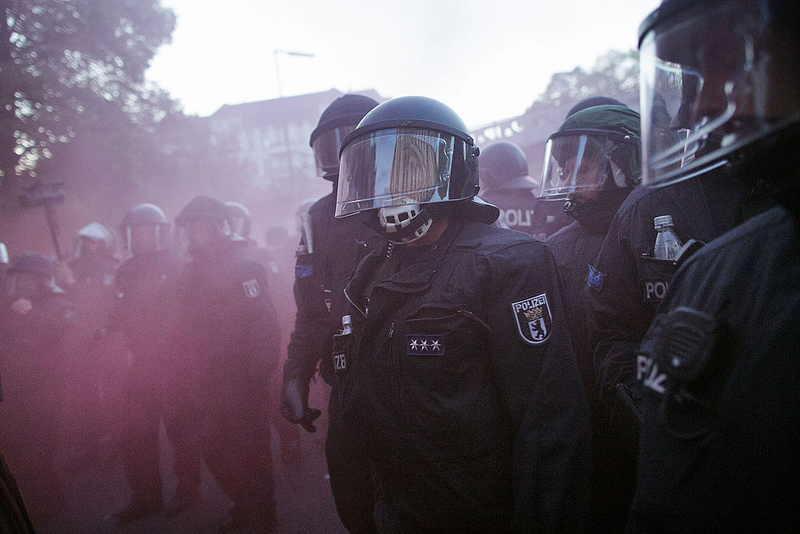 Arnold Plickert, the head of the police union in North Rhine-Westphalia, warned: "Several rival rocker groups, as well as Lebanese, Turkish, Romanian and Bulgarian clans, are fighting for supremacy of the streets. They make their own rules; the police have nothing more to say." "The threat remains, in particular wherever large families, mostly immigrants, place the supposed need for the protection of their loved ones above all else. The readiness for violence is great, the inhibition threshold is low. The punishment of existing laws hardly deters anyone." In Naumburg, police confiscated the driver's license of Ahmed A., a 21-year-old member of a Syrian clan, during a traffic stop. Almost immediately, police were surrounded by a mob of other clan members. The police retreated. The mob then marched to the police station, which they proceeded to ransack. Ahmed A., a serial offender whose asylum application was rejected but who remains in Germany, said: "Lock me up. I have nothing to lose. I am going to put a bullet in the head of every single police officer. I will make your life feel like hell. Then I'll just be a cop killer." He also warned the police officer who seized his license: "I will destroy his life. I know exactly where he lives." He then explained what he would do to the officer's wife and daughter. Ahmed A. was allowed to walk free; police said there were insufficient grounds for his arrest. Naumburg police have defended their weak response as being due to a lack of personnel, but regional parliamentarian Daniel Sturm pointed to the big picture: "We are talking about resistance to the power of the state." The Interior Minister of Saxony-Anhalt, Holger Stahlknecht, said that it appeared as though the Syrian clan had established a "parallel society" in Naumburg. A local newspaper noted that the police's failure to act "sounds like the capitulation of the state of law (Rechtsstaat)." In Mülheim, around 80 members of two rival clans got into a mass brawl following a dispute between two teenagers. When police arrived, they were attacked with bottles and stones. More than 100 police backed up by helicopters were deployed to restore order. Five people were taken into custody but then released. In Munich, police arrested 20 female members of a Croatian clan believed to be responsible for up to 20% of all the burglaries committed in Germany. Investigators believe that the clan has at least 500 members throughout Germany. In Bremen, police effectively surrendered to clans from Kurdistan and the Balkans because of the need to conserve limited personnel resources for the fight against spiraling street crime by migrant youths. Rainer Wendt, head of the German Police Union (DPolG), criticized city officials for their lack of resolve. "Bremen has capitulated to extremely dangerous clans. The state's monopoly of the legitimate use of physical force [Gewaltmonopol des Staates] is now becoming the law of the jungle. Security continues to go down the drain."